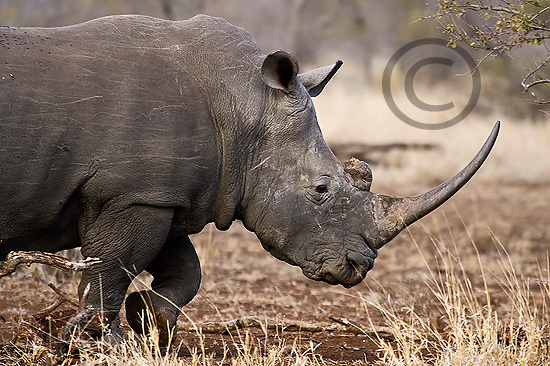 I promised you a more lengthy blog post after my return from the Kruger National Park. Well, here it is! I had a wonderful experience one afternoon that sure taught me a lot, and could also prove beneficial to those reading. A lot is said about patience being one of the greatest virtues of nature/wildlife photography...patience, preparation and knowledge of your subject matter. On this occasion, I had a little more patience than I normally have, and my knowledge of the subject matter enabled me to prepare for an amazing photographic experience. 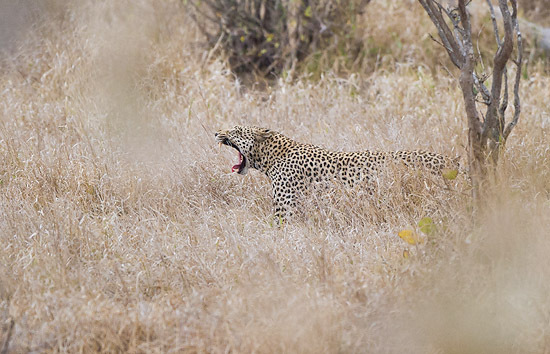 We had come down from the far north of the Kruger Park, having already spent 6 nights in the Park and narrowly missing out on good leopard sightings quite a few times. 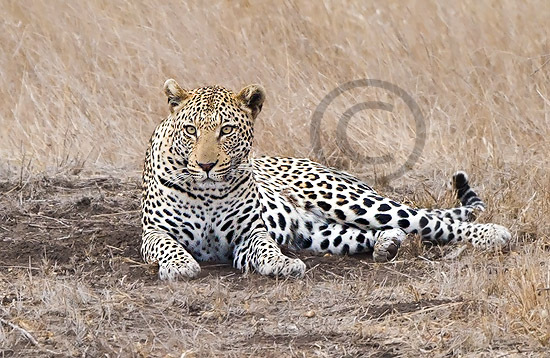 Those who know these cats will know that they are very secretive and often a good leopard sighting can last only 5 minutes or so. The bush in the Kruger Park can also be quite dense in a lot of places, meaning that if the cat is not in the road or right next to it, the most you are going to see is a few spots anyway. Now to get back to the story...we booked into the Olifants rest camp for the night (our 7th night of a scheduled 8). This camp is located in the central region of Kruger, and our next night would be spent in Satara which is even more central and a great region for wildlife viewing with open plains, riverine forests and plenty of life around. 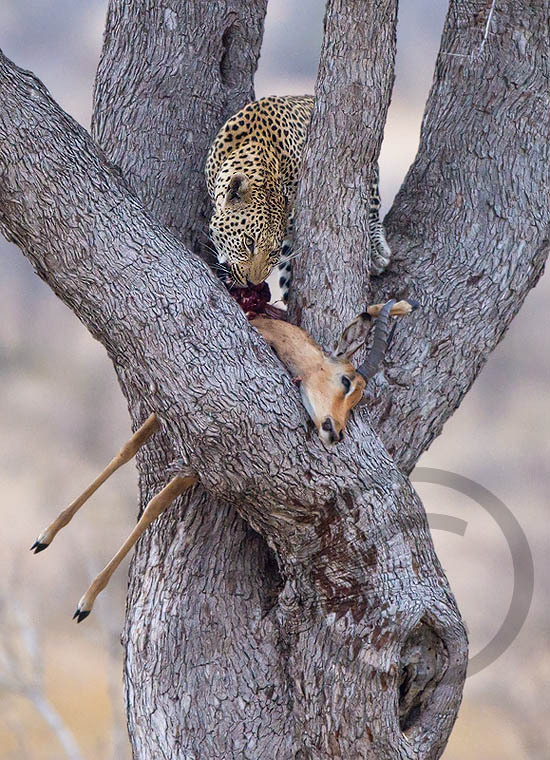 Our neighbours on this particular evening told us of an impala kill that was tucked into a tree by the side of the main road between the camps (and that the kill was still untouched by the time they went past there that particular afternoon). We had come from the north and were thus oblivious of this development. 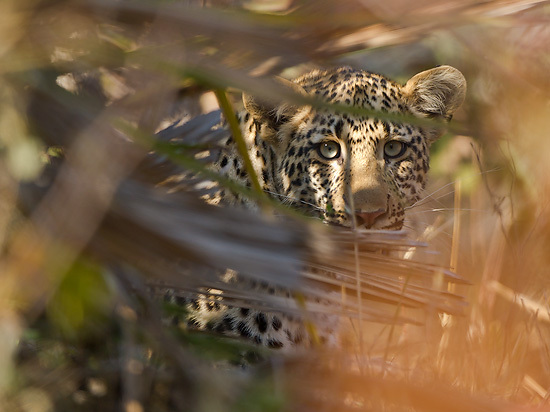 Knowing that there was a very good chance that the leopard would return during the night to feast on its meal, and also then a very good chance that it would be there early morning, I planned to head down there at first light and hope for the best. The next morning I did just that...it was a good 30km from Olifants camp so I only got there at about 07h00 after the gates opened at 06h00. 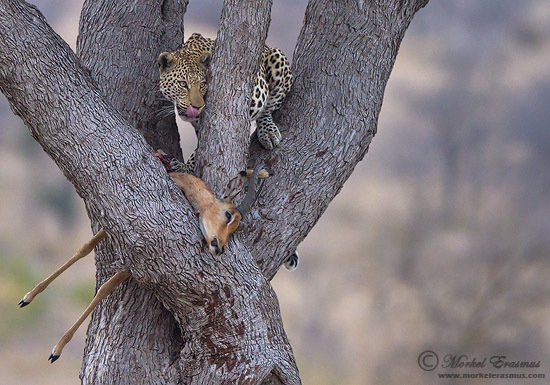 The kill was in the tree allright...but no leopard in sight!! 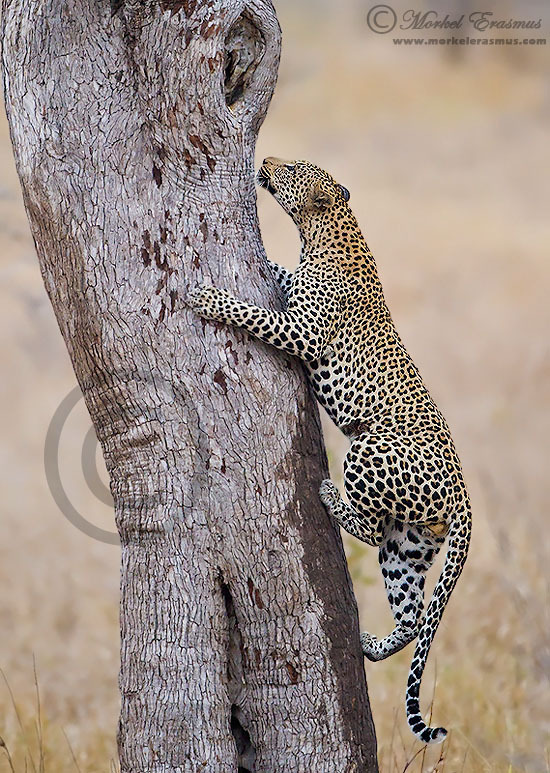 I had always dreamed of getting a good photo of a leopard climbing up a tree. 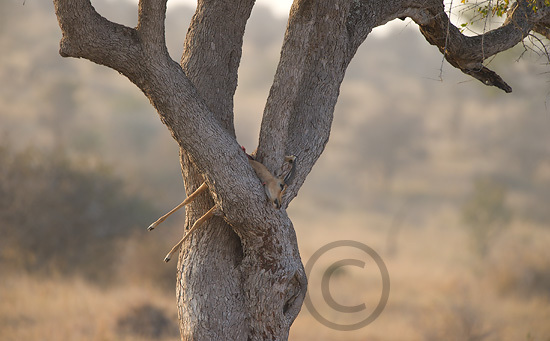 When I returned from the lions I found the kill exactly in the position I had left it in. I went back to the camp to fetch my wife and daughter and our stuff for the move to Satara rest camp which would be our last night in the park. Again, on the way down past the kill it was still as I left it. We headed south, booked into Satara and had a bite to eat. By this time the weather had turned from lovely to pretty murky. It was overcast and starting to drizzle. Still, this was our last 'full day' in the Park and we had to decide where we would head off to for our afternoon drive. 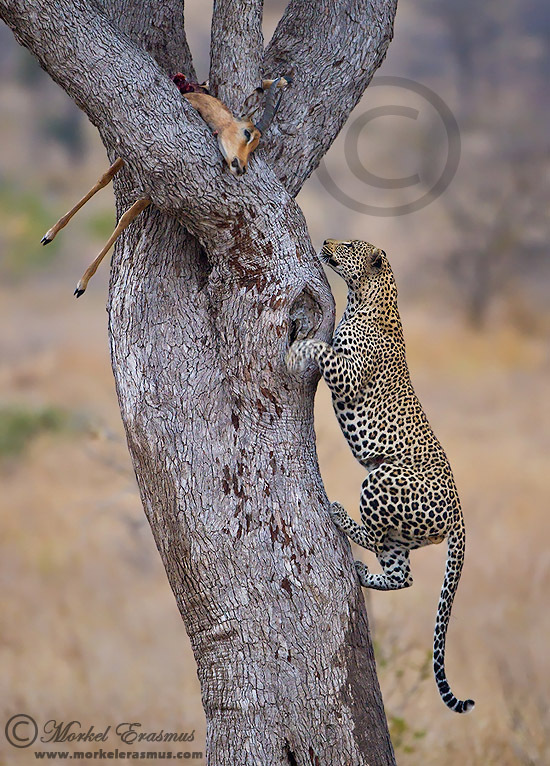 I was haunted by the mental image of that leopard scaling the tree and me not being there to photograph the action...so we decided to stock up on refreshments, load enough toys into the car for our little girl to not get bored quickly, and set off on the 25 odd kilometer drive towards the tree. It was 13h30, and there were no other cars parked there at that stage (also, no leopard yet!). I knew which spot I needed to park in - the only one with a perfect view of the tree at an angle that made it possible to photograph the "climb" and be able to do it regardless of whether the cat decided to ascend from the left, right or front of the tree. Obviously if it decided to scale the trunk from the back I would be screwed - but hey, you have to keep some hope stored up if you want to "bring home the bacon" in nature photography! The kill was in exactly the same position as it had been all day...a good sign? Or not? Was this shy cat even coming back today? 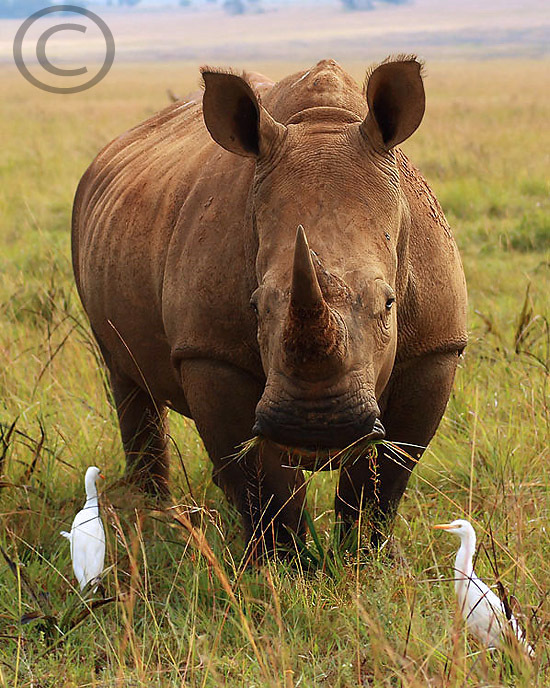 One of the characteristics of Kruger is the visitors/tourists sharing information with each other on sightings and the whereabouts of animals. Many who stopped at our car inquired as to what we were looking at...most thought it was something on the ground - which was humorous as the kill was quite obvious in the tree about 60m from the road. One particular man asked me about it, I pointed it out to him, and he proceeded to tell his wife: "There's a buck in that tree, but it's already dead"
"If you drive a further 2 clicks south you will find one who climbed in all by himself and is sitting in the tree drinking a beer!" 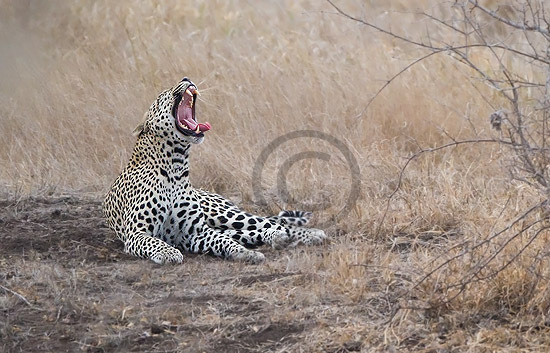 Anyway...16h30...no leopard...16h45...still no leopard...I knew from the start that this was a "six or nix" venture. It was either going to show, or it wasn't. I was either going to have my dream image...or I was going back to camp with an empty memory card. I knew we had to get out of there by 17h30 at the latest, as it would be a solid 30-minute drive back to camp at the speed limit of 50km/h. Gear-wise I had to make a decision. Up to this point I was ready to shoot the action with the Nikon D3s and the Nikkor 500mm f4 VR-II with the Nikon TC-14E 1.4x teleconverter attached. This gave me some much-needed reach towards the position of the tree on my full frame camera body. The problem I was facing was that with sunset approaching and the weather still heavily overcast, I would need to get as much light as possible to reach my camera's sensor when I tripped the shutter. I decided to remove the teleconverter and shoot the 500mm 'wide open' at an aperture of 4 (I had a maximum aperture of 5.6 with the converter attached). At around 17h00 one of the vehicles a little behind us flashed its headlights and the driver indicated to his right...the leopard must have arrived back there! We had to look hard since there were a few small shrubby trees next to us which obscured the view to the Southwest. Finally we noticed its white belly through the branches. 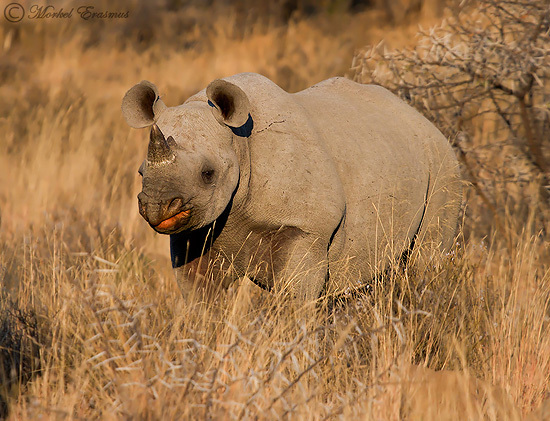 It was lying down under a shrub some distance into the veld. It was SOOO tempting to try and maneuver in reverse to get a glimpse of it, especially considering it might not even approach the tree at all! In the end we decided to hedge our bets on the hope we had cherished all day, and stayed put (besides, if we did move we would lose our vital positioning for the ascent!). The view of the leopard initially from where we had been parked all afternoon...would you have moved? After what felt like hours, eventually I could see the signs that it was getting up to move. It stood up and walked slowly towards the tree. 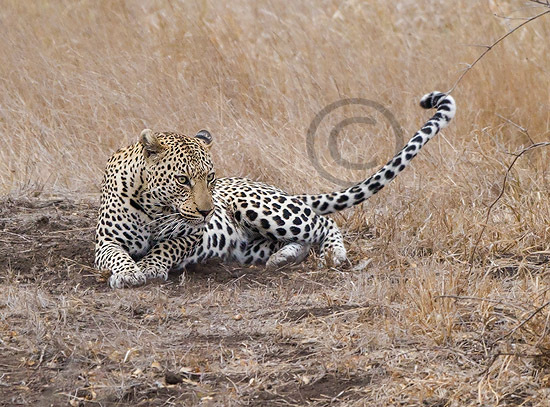 The leopard starts its approach. These images are heavily cropped. 17h15. I went ahead and captured some images. 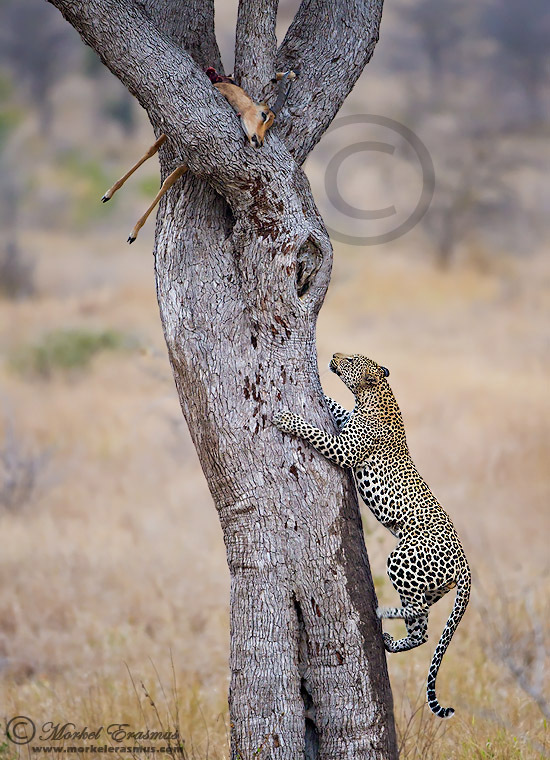 I still had to prepare myself mentally for the possibility that he would not climb the tree before we had to turn around and head back for the night. These images came out much better than I expected and this sighting as a whole turned out to be a great test for my Nikon D3s and its famed low-light performance. I had it set on "auto-ISO" and Manual Exposure mode, meaning that I chose the Shutter Speed and Aperture settings I wanted to use, and the camera would select the ISO sensitivity automatically based on the light meter reading and whether I was opting to adjust the exposure compensation bias up or down. These images are still very heavily cropped - and I was amazed by the detail retained given the crops and the high ISO settings used. 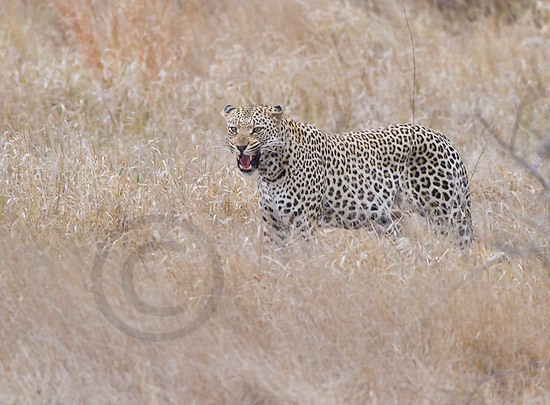 17h20...I was getting agitated now...why doesn't the leopard want to eat? It hadn't been back at the kill since pre-dawn, and had to be slightly hungry? 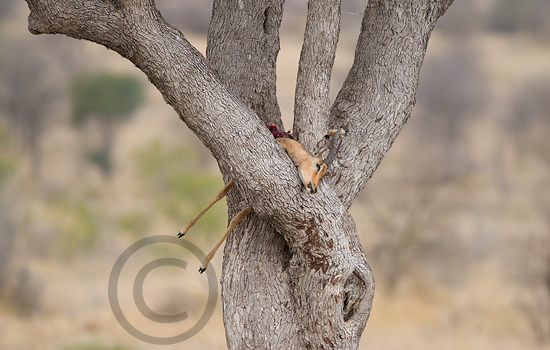 He even looked longingly up at the impala in the tree at one stage. 17h21...the leopard gets up...adrenaline starts pumping through my veins...this is the moment I had been playing over and over in my mind all day, and all my preparation made and chances taken were now going to culminate in these next few seconds...now to focus on not screwing it up!! I quickly metered the light with the camera and took another split-second decision. My chosen shutter speed for the action was 1/400 which was quite slow considering I was using a 500mm focal length (the general rule is you need to have a SS of at least 1/focal-length to get a decently sharp image, though having Nikon's Vibration Reduction technology built into my lens meant I could sacrifice some more). These settings were giving me an ISO of 8000. I wanted to be certain of at least ISO-4000, and therefore decided to half my shutter speed to 1/200. It was a risk! 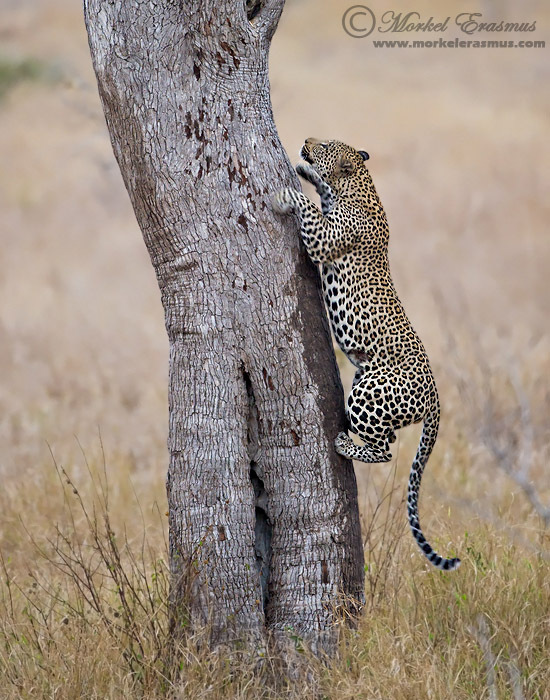 Leopards can climb trees very quickly. If the action was going to happen too fast I would get it all blurry. Then again, having some elements (ideally the paws) slightly blurred would add greatly to the mood/story of the photo. 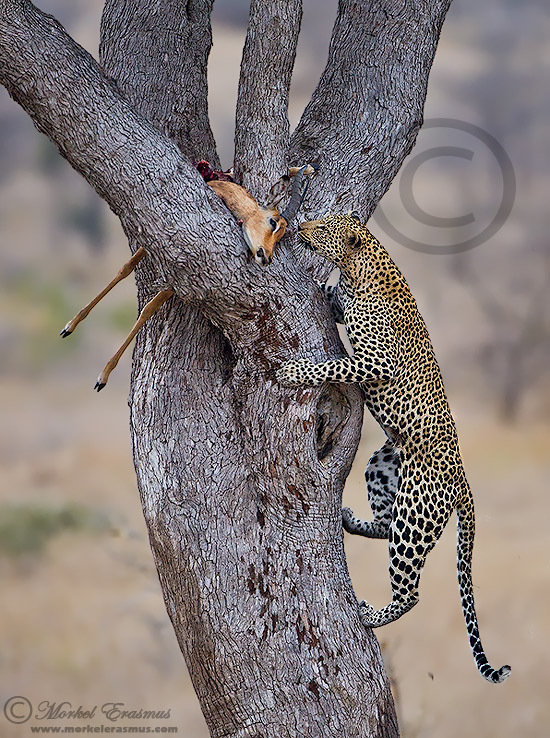 The decision was made for me by the poor quality of light available, and I stuck to my guns and hoped my technique in following the leopard up the tree with the focus point would pull me through. I rotated my camera into the vertical shooting position to get the best framing of the action, and pre-focused on the bark of the tree trunk. I knew that at this focusing distance I should get sufficient depth-of-field this way and it would be easier to keep focus locked during the climb. The D3s would fire at 11 frames per second...how many of those frames would even be usable, if any?? 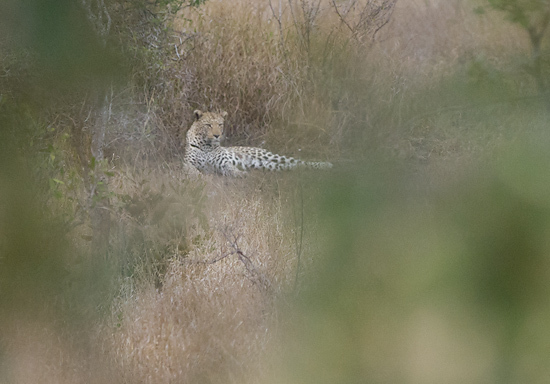 After firing off a few frames of the leopard feeding, I needed to just take a moment to enjoy what we were watching. So often we get caught up in the moment of taking the photographs that we forget to "be there" to witness the natural history taking place, to create memories with our loved ones with us out on safari, and to soak up the feeling of being in the bush. This whole afternoon had come to this...and I loved it! 17h30...We turned around and headed back to Satara as the rain started pouring down ever so lightly...what a day! I hope you were inspired by this account...and I certainly hope it wasn't too long-winded. I probably made up for all those quick blog posts of the past few months here. Anyway - would love your feedback...and if you have similar stories to share, please do so by dropping a comment on this post.